Michael Benjamin Bay (born February 17, 1965) is an American filmmaker known for directing and producing big-budget action films characterized by fast cutting, stylistic visuals and extensive use of special effects, including frequent depictions of explosions. His films, which include Armageddon (1998), Pearl Harbor (2001) and the Transformers film series (2007–present), have grossed over US$5 billion worldwide. He is co-founder of commercial production house The Institute, a.k.a. The Institute for the Development of Enhanced Perceptual Awareness. He is co-chair and part-owner of the digital effects house Digital Domain. He co-owns Platinum Dunes, a production house which has remade horror movies including The Texas Chainsaw Massacre (2003), The Amityville Horror (2005), The Hitcher (2007), Friday the 13th (2009) and A Nightmare on Elm Street (2010). Despite his considerable success at the international box office, Bay's work is generally held in low esteem by film critics. While The Rock (1996) and Transformers (2007) received generally positive reviews, his other films, including the three Transformers sequels, have been received negatively by critics. Michael Bay was born in Los Angeles. He was raised by his adoptive parents Harriet, a bookstore owner/child psychiatrist, and Jim, a Certified Public Accountant (CPA). He was raised Jewish. His grandfather was from Russia. His cousin, Susan Bay, is the widow of the late Star Trek actor Leonard Nimoy (whom he eventually cast as the voice actor for Sentinel Prime in Transformers: Dark of the Moon). He attended the exclusive Crossroads School, in Santa Monica, California. Bay often traces his interest in action films back to an incident during his childhood. As a boy, he attached some firecrackers to a toy train and filmed the ensuing fiery disaster with his mother's 8 millimeter camera. The fire department was called and he was grounded. 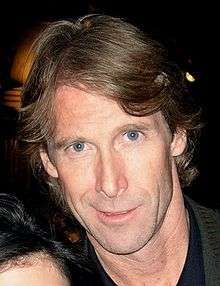 Michael Bay began working at Propaganda Films, directing commercials and music videos, two weeks after finishing his post-graduate degree. His 90-second World War II-inspired Coca-Cola advertisement was picked up by Capitol Records. His first national commercial for the Red Cross, which won a Clio Award in 1992. He directed Goodby, Silverstein & Partners "Got Milk?" advertisement campaign for the California Milk Processors Board in 1993. Bay reteamed with Will Smith and Martin Lawrence for Bad Boys II, a sequel which also marked Bay's fifth collaboration with Jerry Bruckheimer. The film grossed $138 million domestically, enough to cover the production budget, and $273 million worldwide, almost twice as much as the first movie. In 2005, Bay directed The Island, a science fiction film starring Ewan McGregor and Scarlett Johansson. It was the first film Bay made without Jerry Bruckheimer as a producer. The Island cost $126 million to produce and earned $35 million domestically and $172 million worldwide. Bay stated that he was not comfortable with the domestic marketing campaign, as it confused the audience to the true subject of the film. In 2007, he directed and teamed up with Steven Spielberg to produce Transformers, a live action film based on the Transformers franchise. The film was released in the U.S. and Canada on July 3, 2007, with 8 p.m. preview screenings on July 2. The previews earned $8.8 million, and in its first day of general release it grossed $27.8 million, a record for Tuesday box office attendance. It broke the record held by Spider-Man 2 for the biggest July 4 gross, making $29 million. On its opening weekend, Transformers grossed $70.5 million, amounting to a $155.4 million opening week, giving it the record for the biggest opening week for a non-sequel. As of November 2007, the film has made over $319 million domestically and over $708 million worldwide. Bay returned as director and executive producer for Transformers: Revenge of the Fallen, which was released on June 24, 2009 and went on to gross over $832 million worldwide. Although it received mostly negative reviews by critics, including aggressively critical reviews by American film critics such as Roger Ebert, Michael Phillips and David Denby (who referred to Bay as "stunningly, almost viciously, untalented"), the film was well received by its intended audience and was one of the highest-grossing films of 2009. In 2010, it earned seven Golden Raspberry Award nominations and winning three: Worst Picture, Worst Director and Worst Screenplay. It was also one of the best selling DVD and Blu-ray Discs of 2009, second only to Twilight in DVD format and the number one of all time in Blu-ray format until it was surpassed by Blu-ray sales of James Cameron's Avatar in April 2010. Bay directed Transformers: Dark of the Moon, released on June 28, 2011. His next film was a "small" film he had been developing for years, called Pain & Gain. The true crime story, based on events described in a Miami Herald article written by Pete Collins, concerns a group of bumbling bodybuilders working together to commit a robbery. Gideon's Sword, Douglas Preston and Lincoln Child's novel set for release in February 2011, was optioned by Bay Films and will be produced by Michael Bay. The main character, Gideon Crew, avenges the death of his father. On February 13, 2012, Paramount Pictures announced that Bay would produce and direct a fourth Transformers movie. The film, titled Transformers: Age of Extinction, was released in June 2014. As of June 2013, Bay is committed to directing a live action adaptation of the video game series Ghost Recon, to be produced by Warner Bros..
Bay founded this production house with fellow producers Brad Fuller and Andrew Form in 2001. Platinum Dunes is named after one of Bay's first student films at Wesleyan University. Brad Fuller also graduated from Wesleyan and worked for Bay as an executive assistant before joining him in this business venture. The company's first film, a remake of the 1974 film The Texas Chain Saw Massacre, grossed $107 million worldwide. Platinum Dunes produced lucrative remakes of classic horror films and introduced new directors like Sam Bayer and Marcus Nispel to feature film audiences. Their most recent horror film production, A Nightmare on Elm Street starring Jackie Earle Haley as Freddy Krueger, was released April 2010. The film made 32.9 million dollars in its opening weekend, covering nearly its entire 35 million dollar budget and went on to gross over 100 million dollars worldwide. Paramount Pictures signed a first look deal with Platinum Dunes in 2009. As part of this new relationship, Paramount Pictures and Nickelodeon brought the Platinum Dunes producers on to produce the new Teenage Mutant Ninja Turtles, rebooting the film series launched by New Line in 1990. Bay, Fuller and Form co-produced with Galen Walker, Scott Mednick and Marina Norman and are working on the sequel for a June 3, 2016 release date. Platinum Dunes is currently in the process of selling an unnamed TV series to a "major cable network" with Bay in talks to direct the pilot. Bay and Wyndcrest Holdings, a Florida-based investment firm, acquired the digital effects company Digital Domain from James Cameron and Stan Winston in 1996, infusing the struggling business with a $50 million investment. Digital Domain considered an initial public offering in 2009 but ultimately withdrew the offer, because of the lack of interest. Currently a work for hire visual effects production house, Digital Domain plans to expand its efforts in the video gaming industry and become a full-fledged motion picture production house. Headquartered in Venice, Los Angeles, California, the company is also working to open branches in Vancouver, Canada and the state of Florida. After leaving Propaganda Films, Bay and producer Scott Gardenhour, also formerly at Propaganda, formed The Institute for the Development of Enhanced Perceptual Awareness (now known as The Institute), to produce commercials and other projects. Through The Institute, Bay has directed and produced spots for Victoria's Secret, Lexus, Budweiser, Reebok, Mercedes-Benz, and Nike. His most recent advertisement for Victoria Secret was the 2009 "A Thousand Fantasies" holiday campaign. Bay co-founded 451 Media Group with Doug Nunes (who serves as CEO), and with John and Anthony Gentile, who previously marketed brands such as Micronauts, Visionaries, Sky Dancers and the Power Glove. In 2015 the company announced an interactive publishing division to offer "augmented reality" content from printed graphic novels with digital video. The graphic novels employ Touchcode technology from T+ink (previously used in the Power Glove), in which ink used in the printing process unlocks access to exclusive content that is housed on the Machinima Network, which is transferred to users' touch-screen-enabled mobile devices when the printed books are touched to those devices. The company's premiere slate of graphic novels will be unveiled at the October 2015 New York Comic-Con. The creators involved include Scott Rosenberg, Skip Woods, George Pelecanos, Mark Mallouk, Clay McLeod Chapman and Peter and Paul Williams. Bay lives in Los Angeles and Miami with his two bullmastiffs, Bonecrusher and Grace, named for characters in Transformers and Armageddon, respectively. As a boy, he donated his Bar Mitzvah money to an animal shelter and often includes his bullmastiff dogs in his films.<ref Bonecrusher appeared as Mikaela's dog "Bones" in Transformers: Revenge of the Fallen. Mason, his first bullmastiff, was named for John Patrick Mason, played by Sean Connery in The Rock. Bay previously had another dog, Mason, whose final appearance in a film was as Miles' dog in Transformers. Mason died during production of that film in March 2007. Bay owns a $50 million Gulfstream G550 jet, as well as a Bentley, a Range Rover, an Escalade, a Ferrari, a Lamborghini and two Camaros from the Transformers franchise. Despite his box office success, Bay has found little critical praise, and his name is often used pejoratively among art-house circles. The 2004 puppet film Team America: World Police directed by Matt Stone and Trey Parker (creators of South Park) features a song titled "The End of an Act", which bashes Bay and Pearl Harbor. Bay has responded to his critics, saying "I make movies for teenage boys. Oh, dear, what a crime." 1 2 "Digital Domain". Retrieved 2010-07-03. ↑ Boucher, Geoff (2009-05-24). "Michael Bay, master of the 'huge canvas'". Los Angeles Times. Sam Zell. Retrieved 2010-07-03. 1 2 3 "Michael Bay- Biography". Yahoo! Movies. Retrieved June 17, 2013. ↑ Horn, John (2005-07-17). "You Call This Paradise?". The Los Angeles Times. Retrieved 2010-07-11. ↑ Denby, David (2009-07-06). "Tommy Guns and Toys". The New Yorker. Condé Nast Publications. Retrieved 2010-08-25. ↑ Drawbaugh, Ben (2010-10-29). "Transformers 2 tops chart, best selling Blu-ray of all time?". Engadget. Retrieved 2010-08-31. ↑ Lawler, Richard (2010-04-26). "Avatar smashes Blu-ray sales records, has some owners ready to smash incompatible players". Engadget. Retrieved 2010-04-27. ↑ Abrams, Natalie (2010-04-14). "Michael Bay Announces Reality TV Adventure Series". TVGuide.com. Lionsgate. Retrieved 2010-09-02. ↑ McNary, Dave (2010-05-24). "Paramount picks up 'Sword'". Variety. Reed Elsevier. Retrieved 2010-09-02. ↑ "Box Office Mojo – The Texas Chainsaw Massacre (2003)". Retrieved 2010-09-13. ↑ Box Office Mojo – A Nightmare on Elm Street (2010) Retrieved 6-16-2010. ↑ Fleming, Michael (2010-06-09). "Paramount signs with Platinum Dunes". Variety. Reed Elsevier. Retrieved 2010-09-13. ↑ "'Teenage Mutant Ninja Turtles' Sequel Underway; Bay To Return". Deadline.com. August 10, 2014. Retrieved August 10, 2014. ↑ "'Teenage Mutant Ninja Turtles' sequel set for 2016". Entertainment Weekly. August 10, 2014. Retrieved August 10, 2014. ↑ "Michael Bay Talks Transformers 4, Pain & Gain". MichaelBay. 2012-02-13. Retrieved 2014-08-04. ↑ Verrier, Richard (2009-10-13). "Digital Domain, whose backers include Michael Bay, is opening a Florida branch". The Los Angeles Times. Sam Zell. Retrieved 2010-07-13. ↑ McNary, Dave (August 25, 2015). "Michael Bay’s 451 Media Group Launching Interactive Publishing Arm". Variety. ↑ Wickline, Dan (August 25, 2015). "Michael Bay’s 451 Media Group To Publish Hi-Tech Graphic Novels". Bleeding Cool. ↑ Damore, Meagan (August 25, 2015). "Michael Bay's 451 Media Group Announces Interactive Graphic Novels". Comic Book Resources. ↑ Kamen, Matt (August 26, 2015). "Michael Bay is launching a range of 'augmented reality comics'". Wired. ↑ Josh Eells (January 4, 2016). "13 Hours': Can Michael Bay Pull Off a Gritty Movie About Benghazi?". Rolling Stone. Retrieved March 10, 2016. ↑ Selcke, Dan (July 7, 2014). "Here's a learned analysis of why Michael Bay movies are bad, but pretty". The A.V. Club. Retrieved January 16, 2016. "No matter how many buildings, spacecrafts, and sentient robots Michael Bay explodes, the director can’t seem to get any respect. His movies are panned by critics, and his bombastic filmmaking style is routinely mocked by respectable, erudite writers on the Internet." ↑ Rodriguez, Rene. "The Mere Mention of His Name Is Enough to Make Movie Critics Hiss and Groan". MichaelBay.com. Retrieved 2014-06-21. ↑ Curtis, Bryan (2005-06-15). "The Bad Boy of Summer: Michael Bay vs. his Critics." Slate.com. Retrieved 2014-07-25. ↑ "Transformers: Age of Extinction". Rotten Tomatoes. Retrieved 2014-08-04. ↑ "13 Hours: The Secret Soldiers of Benghazi". Rotten Tomatoes. Retrieved 2016-01-19.